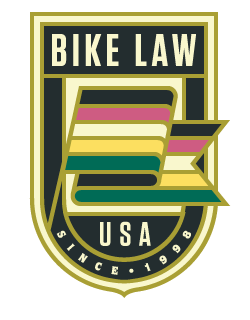 Bike Law North Carolina, Ann Groninger, has been protecting bicyclist's for 12 years and has written the book on North Carolina Bicycle Laws. North Carolina’s varied geography and year-round riding climate make for ideal bicycling conditions. The fall and spring are especially pleasant times for cycling on the state’s network of quiet rural roads. You’ll find challenging hills in the Blue Ridge Mountains, rolling terrain in the Piedmont and hundreds of miles of flat coastal plain riding in the eastern part of the state. Unfortunately, bicyclists in North Carolina face some of the country's most archaic and unfair laws, including the antiquated contributory negligence doctrine. Also, rapid urbanization and the resulting suburban sprawl in several cities have put traffic pressure on old farm-to-market roads and increased the level of hostility toward bicyclists. North Carolina lawyer and Bike Law founder, Ann Groninger, has advocated at the state level on behalf of bicyclists in North Carolina for over 12 years. She recently submitted a letter in support of two-abreast riding to a legislative study group weighing a potential change in the law. Ann wrote the book on North Carolina bicycle laws. It's called the "Ride Guide (BLB #1: North Carolina Bicycle Laws)" and can be viewed below or downloaded here: Ride Guide NC. Ann has offices in Charlotte and Durham and has helped bike accident clients in Asheville, Raleigh, Durham, Greenville, Wilmington, Fayetteville, and throughout the state. Read more about Ann on her bio page. On July 12, House Bill 959 was signed into law and it changes a few things for bicyclists. A little background, if you haven’t been following along. Last summer, the Legislature passed HB 232 and set up a working group to study North Carolina bicycle laws. By the end of the year, the North Carolina Department of Transportation issued a report making a number of recommendations, some recommended by the bicycle safety working group, for changing our state’s bicycle laws. The new law includes three of the working group’s recommendations and an additional one they did not specifically address. Let’s look at each one individually. The actual wording of each law is in italics. (1) A lighted lamp on the front thereof, visible under normal atmospheric conditions from a distance of at least 300 feet in front of such bicycle. SECTION 5.1. (b) This section becomes effective December 1, 2016, and applies to offenses committed on or after that date. What it means: As of December 1, bicyclists riding in the dark are required to have both a front and rear light, both visible from 300 feet. It also provides an alternative (reflective clothing) as a possibly more affordable option. The new law retains some of the odd wording contained in the original statute. (Why not use the word reflector; what is a reflex mirror?) The language could also lead to confusion: is a reflector required when the bicyclist has an operating rear light on the bicycle? Such a requirement would make no sense, as the visibility of the light would supersede that of the reflector. The purpose of retaining the “reflector” language can only have been intended as a backup for when the light fails. For more on lighting, see here and here. (1) The slower moving vehicle to be passed is a bicycle or a moped. (2) The slower moving vehicle is proceeding in the same direction as the faster moving vehicle. (3) The driver of the faster moving vehicle either (i) provides a minimum of four feet between the faster moving vehicle and the slower moving vehicle or (ii) completely enters the left lane of the highway. (4) The operator of the slower moving vehicle is not (i) making a left turn or (ii)signaling in accordance with G.S. 20-154 that he or she intends to make a left turn. (5) The driver of the faster moving vehicle complies with all other applicable requirements set forth in this section. What it means: This new law does not allow a free-for-all for passing. Drivers are now allowed to pass bicyclists (and moped drivers) in no passing zones in the limited circumstances where: (1) there is enough sight distance to see that the way is clear, (2) the driver allows 4 feet of passing distance or moves completely into the other lane and (3) does not pass when the cyclist is making or is about to make a left turn. Will making passing easier help make the roads safer for bicyclists? Most drivers already pass bicyclists in no passing zones; although it was technically illegal the restriction was rarely enforced. When done correctly, it promotes peaceful co-existence between drivers and bicyclists. When drivers pass bicyclists without enough distance between themselves and the bicyclists or without enough sight distance ahead, the maneuver is very dangerous. The new law provides important safety measures for a practice that most already follow. Keep in mind that in other passing situations, the distance in North Carolina remains 2 feet. (a) The driver of any vehicle upon a highway or public vehicular area before starting, stopping or turning from a direct line shall first see that such movement can be made in safety, and if any pedestrian may be affected by such movement shall give a clearly audible signal by sounding the horn, and whenever the operation of any other vehicle may be affected by such movement, shall give a signal as required in this section, plainly visible to the driver of such other vehicle, of the intention to make such movement. The driver of a vehicle shall not back the same unless such movement can be made with safety and without interfering with other traffic. The new law makes a couple of changes. The first is to increase punishments in certain motor vehicle – bicycle crashes. (a1) A person who violates subsection (a) of this section and causes a motorcycle or bicycle operator to change travel lanes or leave that portion of any public street or highway designated as travel lanes shall be responsible for an infraction and shall be assessed a fine of not less than two hundred dollars ($200.00). A person who violates subsection (a) of this section that results in a crash causing property damage or personal injury to a motorcycle or bicycle operator or passenger shall be responsible for an infraction and shall be assessed a fine of not less than five hundred dollars ($500.00) unless subsection (a2) of this section applies. (a2) A person who violates subsection (a) of this section and the violation results in a crash causing property damage in excess of five thousand dollars ($5,000) or a serious bodily injury as defined in G.S. 20-160.1(b) to a motorcycle or bicycle operator or passenger shall be responsible for an infraction and shall be assessed a fine of not less than seven hundred fifty dollars ($750.00). A violation of this subsection shall be treated as a failure to yield right-of-way to a motorcycle or bicycle, as applicable, for purposes of assessment of points under G.S. 20-16(c). In addition, the trial judge shall have the authority to order the license of any driver violating this subsection suspended for a period not to exceed 30 days. If a judge orders suspension of a person’s drivers license pursuant to this subsection, the judge may allow the licensee a limited driving privilege for a period not to exceed the period of suspension. The limited driving privilege shall be issued in the same manner and under the terms and conditions prescribed in G.S. 20-16.1(b)(1), (2), (3), (4), (5), and G.S. 20-16.1(g). The second change is to clarify hand signals and to give bicyclists the option that most already use – extending the right arm to signal a right turn. (b) The signal herein required shall be given by means of the hand and arm in the manner herein specified, or by any mechanical or electrical signal device approved by the Division, except that when a vehicle is so constructed or loaded as to prevent the hand and arm signal from being visible, both to the front and rear, the signal shall be given by a device of a type which has been approved by the Division. Whenever Except as otherwise provided in subsection (b1) of this section, whenever the signal is given the driver shall indicate his intention to start, stop, or turn by extending the hand and arm from and beyond the left side of the vehicle as hereinafter set forth. Left turn – hand and arm horizontal, forefinger pointing. Right turn –upper arm horizontal, forearm and hand pointed upward. Stop – upper arm horizontal, forearm and hand pointed downward. (b1) Notwithstanding the requirement set forth in subsection (b) of this section that a driver signal a right turn by extending his or her hand and arm from beyond the left side of the vehicle, an operator of a bicycle may signal his or her intention to make a right turn by extending his or her hand and arm horizontally, with the forefinger pointing, from beyond the right side of the bicycle. What it means: This section addresses movements other than passing. The changes to the section include (1) an increase in punishment when a violation of the law causes injury to a bicyclist and (2) a clarification and slight change to hand signal requirements. The increased punishments for violation of this section already applied in cases where property damage or injury of a motorcyclist resulted. It now extends those punishments to crashes involving bicyclists. Personal, Realistic and Always Looking For My Best Interest. Last year I was hit by a drunk driver while on my bicycle sustaining severe injuries. I turned to Bike Law to represent me. From the beginning they were very personable, realistic and were always looking out for my best interest. Throughout the whole process they kept me well informed and were accessible when needed. This allowed me to focus on my recovery. If you have been in a bike-car crash anywhere in North Carolina, we are here to help. We've handled dozens of bike accident claims. To get started, please complete our Bike Accident Report Form and we'll contact you as soon as possible. All we need is your name, e-mail, phone number, and a few details about the circumstances of your crash. Bike Law features pages on biking in Raleigh, Durham and Charlotte. Charlotte: Charlotte has an active bicycling population and is moving forward with a progressive plan to accommodate bicyclists on and off the road. Biking infrastructure includes signed bike routes and painted bike lanes and bike boxes. A significant challenge that cyclists face is Charlotte’s rapid growth and suburban sprawl – an average of 44 new residents move there every day – and that puts pressure on the city’s infrastructure. Durham: Durham is earning a reputation as a bicycling destination and was recently compared favorably to the biking mecca of Portland, Oregon. Yet, local bicycling advocates say there is still much work to do. Highlights of biking in Durham include the 22-mile American Tobacco Trail which connects downtown Durham to neighborhoods and counties to the south. Raleigh: Raleigh's updated Comprehensive Bicycle Plan calls for 440 miles of new biking facilities, up from three stretches of bike lanes just a decade ago. Like other North Carolina cities, Raleigh is growing rapidly, and suburban sprawl is putting pressure on roads near the city’s edges. Raleigh has an extensive greenway network, including a 27-mile trail along the Neuse River. Besides the cities listed above, other North Carolina cities with major biking networks include Asheville, Wilmington, Cary, High Point, Winston-Salem, Greensboro and Carrboro / Chapel Hill. Carolina Connection—US Bike Route 1: Designated as a portion of US Bike Route 1, this route covers almost 200 miles of rolling terrain and is the main north/south connector route through the central portion of North Carolina. Mountains to Sea—NC Bike Route 2: Bike Route 2 is a challenging 700-mile route from the mountain town of Murphy in western corner of the state to the coastal town of Manteo. Ports of Call—NC Bike Route 3: This 300-mile north-south route from Virginia to South Carolina passes through several historic port cities, including Edenton, Bath, New Bern, Wilmington and Southport. North Line Trace—NC Bike Route 4: This 400-mile east-west route runs along North Carolina’s border with Virginia from the mountains to the coast, passing near or through Eden, Roxboro, Henderson, Roanoke Rapids, and Elizabeth City. Cape Fear Run—NC Bike Route 5: This 160 mile route runs parallel to the Cape Fear River in the coastal plain. Piedmont Spur—NC Bike Route 6: This 200-mile route is a southern alternative to the increasingly urban Piedmont portion of the Mountains to Sea route. It passes through Morganton, Lincolnton, several Charlotte suburbs and Albemarle, ending near Snow Camp. Ocracoke Option – NC Bike Route 7: This 170-mile route picks up from Bike Route 2 near Wilson and winds through the coastal plain to the Cedar Island Ferry over to Ocracoke. Towns on or near the route include Wilson, Goldsboro, Kinston and New Bern. Southern Highlands—NC Bike Route 8: This 120-mile route passes through several mountain towns, including Brevard, Saluda, Flat Rock, Tryon and Forest City before ending at the NC 6 Piedmont Spur in Lincolnton. Sandhills Sector—Bike Route 9: This 125-mile route features rolling terrain and passes near Pinehurst, Southern Pines and south of Fayetteville. It connects with the NC 6 Piedmont Spur near Albemarle and ends near the Cape Fear River at NC 5 Cape Fear Run. Each year an average of 960 bicyclists are hit by vehicles in North Carolina, making it one of the least safe states in the U.S. for bicycling. On average, about 20 bicyclists are killed each year in North Carolina, according to WatchForMeNC.com. North Carolina ranked 10th in deaths per million, at 2.59 in 2011, putting it among the nation’s top 10 “most dangerous states for cyclists,” according to a 2014 article in the Asheville Citizen-Times. The article cited an Insurance Business America website report and DOT data. The state has only shown a slight improvement since then. That fatality rate had fallen to 2.23 per million – or 14th worst of all states, according to a May 2015 NHTSA report, which reported on statistics for 2013, when 22 cyclists were killed.